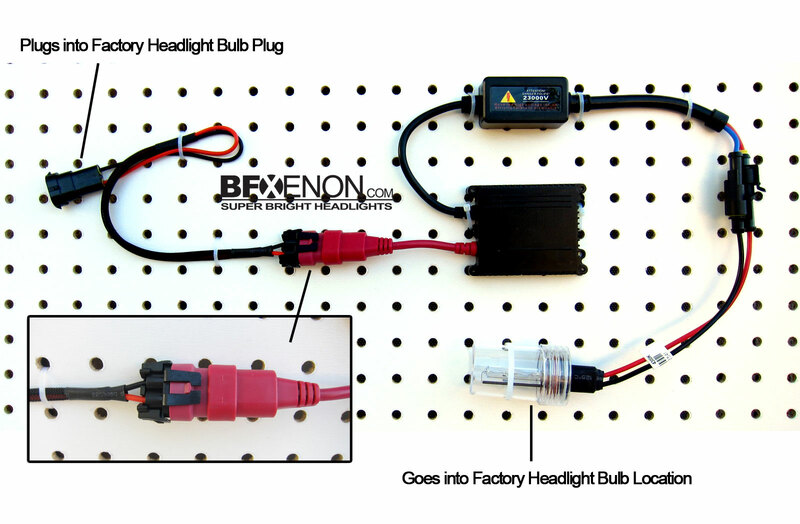 Here is a simple How-To when it comes to installing BFxenon Plug and Play HID Headlights or Fog Lights. Here you see a straight forward plug and play setup for any single beam vehicle. The only time this will vary is when it comes to vehicles that need an anti-flicker kit, like Dodge, Jeep, and Chrysler vehicles. If you have one of these vehicles, the anti-flicker kit will go right between the plug from the factory and the ballast. By now, I'm sure you have seen those extremely bright white lights driving on the road. But, maybe you haven't and you didn't know there was a product that would increase your headlight output by 300%? Automotive lighting technology has advanced over the last 5-10 years and it is now easier then ever to upgrade your headlight bulbs to produce a much more powerful light. Brighter headlights can really give your car a unique night time look, while also making driving safer and less stressful, due to the increased visibility in the darkness, especially on unlit roads. How days, H13, 9006, and H11 bulbs are the most popular fitting for headlights - closely followed by H1 and H7 bulbs. Does Your Car Have Factory HID Lights? Happy Holidays from BFxenon! In honor of another year of growth, we would like to offer all our supporters a 25% coupon code good for any BFxenon HID light order! This year we aim to do more kits than ever before and we are making deals left and right! Lights, Wheels, Tires, Accessories, etc. If you have any questions, or would like to inquire about any product we sell, please email Sales@BFxenon.com! and HURRY, this sale is ending soon! The BFxenon has a variety of bulb colors available. I chose the 6000K color which most closely matches an OE HID setup. The lights have the usual Xenon bright white beam which helps on the mountain roads that I drive on. The headlights provide excellent visibility and improved the high beam performance. The high beam lighting is one area I've always felt the 500 could use some help in. Summed up, the installation went together well, with everything snapping together and other than reversingconnector 1 there were no surprises. BFxenon was quick to answer any questions and provides a 10-Day Satisfaction full money back guarantee and 6-Month Replacement Warranty. 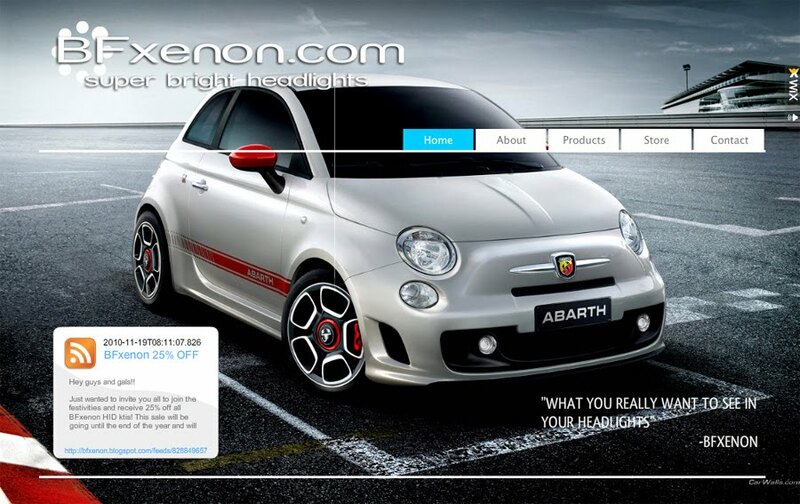 Not satisfied with your stock FIAT 500 Lights? 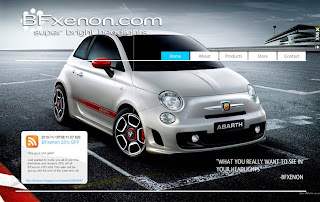 BFxenon.com has developed an HID Xenon Light kit with performance, durability and ease of installation in mind. 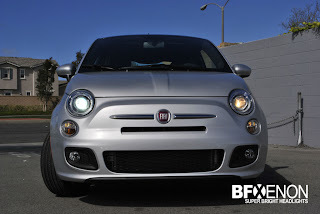 This kit has been specifically designed as an upgrade to your existing Fiat 500 Low Beam and High Beam lights. 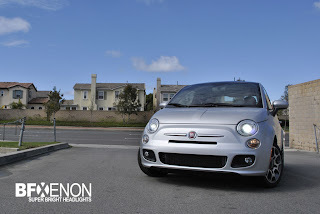 BFxenon’s NEW Fiat 500 USA HID lights assist the driver tremendously in providing an expanded view of what is ahead. Essentially these Xenon Lights enhance your overall view by providing you to see an extended and lengthened stretch of the road. BFxenon HID lights play a crucial role in the overall safety of the driver by enabling you to identify dangerous obstacles effortlessly and more rapidly. 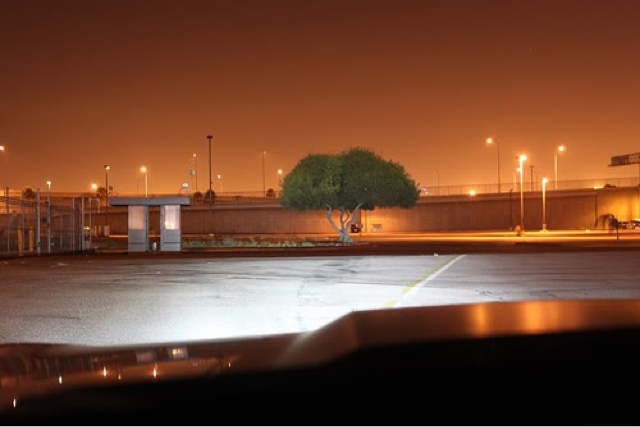 The HID life expectancy is up to 10 times longer than the factory halogen bulbs and shines 3x brighter. All aftermarket HID kits this kit is sold for off road and show use only. HID conversion kits may not be legal for road use in some areas. Please check your local laws prior to ordering. *The manufacturer will replace the product at no charge if it fails to work as designed. The lifetime warranty does not cover abuse or misuse of the product. The manufacturer reserves the right to replace the product with a similar product if the exact product is no longer manufactured. The owner is responsible for all shipping costs associated with the warranty exchange. The product is warrantied to the buyer and is non-transferable. Please keep the original proof of purchase receipt for all warranty claims. Customer is responsible for shipping defective product back to BFxenon. Special Thanks to all of the C5 Members for your support and great feedback! Due to the growth this past year, BFxenon has had the opportunity to increase productivity as well as development! These changes have allowed us to lower our Camaro HID prices while maintaining the same quality and fast delivery times! Once again BFxenon has done it! 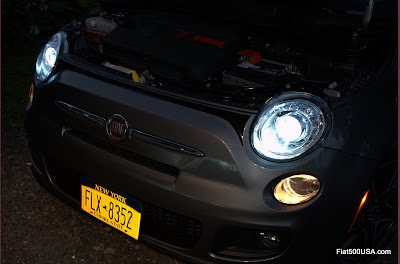 We have just installed the first HID conversion for the new 2011 Fiat 500! 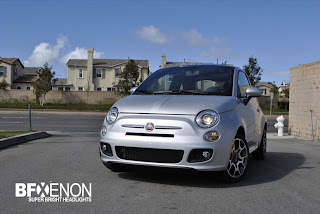 We got the great opportunity to visit OC Motorsports (BFxenon Distributor) in Costa Mesa, CA and install our lights in this new Fiat. The install was very easy and only took about 45 minutes. the hardest part to the install was finding a place to mount the ballast with so little engine compartment room. This also inspired us to engineer a new ballast bracket to help the install process go more smoothly. High Intensity Discharge (HID) lighting is the technology where light is created from electrical current passing through metal vapor. In HID bulbs, a tube of glass is filled with gas and has two electrodes on either side. When an arc of electrical current is established between the electrodes, the metallic vapor releases energy in the form of light. HID lighting has several advantages over fluorescent or halogen lighting and is starting to be used more as a replacement for halogen lights as automobile headlights. One advantage of HID lights is that HID lights are brighter and give better visibility to drivers than halogen lights. You as the driver will be able to see further and more clearly at night, also other drivers will be able to see better due to your lights. HID light bulbs also last longer than halogen lights. Since HID lights do not have a filament in them that could burn out like halogen lights, HID light bulbs can last 2000-3000 hours vs 450-1000 hours for halogen light bulbs. HID lighting requires less energy consumption than halogen lighting. HID lighting uses 35w vs 55w for halogen lighting. Most cars are set up with a 55w output, so if you are converting to HID lighting make sure to install the ballasts that come with your conversion kit so that the output will be reduced to 35w. 2) When converting to HID lighting or replacing HID light bulbs, you want to make sure to always get a matched pair of HID bulbs. After about 100-500 hours of use, HID light bulbs undergo what is called a color shift. The light emitted by the bulb will shift slightly from a yellowish color to a more crisp blue color. You want a matched pair of HID bulbs so that this color shift occurs at the same time. When buying HID light bulbs, make sure that they have the same manufacturer, part number and use time (if previously used). 3) Understand the Kelvin temperature (k). When talking about lighting, Kelvin is the old way of measuring color based on how hot something burns. HID conversion kits and bulbs come in different colors and brightness as described by the bulbâs Kelvin temperature. Some important things to note about Kelvin temperature is that it describes the color the light will be and the lower the Kelvin temperature, the brighter the bulb. The Kelvin temperature scale for HID bulbs goes from 3000-12000k; 3000k being the brightest light and 12000k being the least bright. Typical lights and the colors each admits are 3000k (yellow), 4300k (white), 6000k (light blue), 8000k (deep blue), 10000k (bright violet) and 12000k (bright purple). 4) How to maintain and extend life of your HID bulbs. HID light bulbs last longer than other forms of lighting, but there are steps you can take to maintain their long life. a. Use the right ballast and housing that is matched to your HID light. b. Let your bulbs cool down between lightings. Turning an HID light off and on more than three times in an hour reduces the life of your bulb. c. Set the HID light to burn in the correct position and plane which is horizontal +/-10% burn positioning. d. Avoid touching the bulb with your skin. Oils and acids from the skin deposited on the glass can damage the bulb. 5) Use caution when handling HID lighting. Do not handle HID bulbs excessively because oils from your skin can be transferred to the bulb and damage it. Also because HID light bulbs are filled with metallic vapors, in some cases mercury, caution should be used not to break them and when disposing of them. The voltage produced by the electrodes in the bulb is high and could give a shock if you are too close. The headlight assembly will protect you from this, but use caution when changing bulbs. Step 2: Pull the grill back, lift up on the large tab and pull the grill back at the same time. Step 4: In the fender well is a access panel to 1 more 10mm bolt and a long white plastic sliding clip that holds the headlight in. Pull the sliding clip down and remover the bolt. Step 5: Once you have the headlight housing out, you will need to remove the cap and drill a 1" hold for the wires to come through. Step 7: Replace cap back into factory housing with the HID wires coming out the back. The wires coming out of the factory plug go into the Anti-Flicker kit and the Anti-Flicker kit goes into the ballast. Step 8: Mount the ballast and AF Kit. *These are recommended mounting points... you may mount them according to your preference.